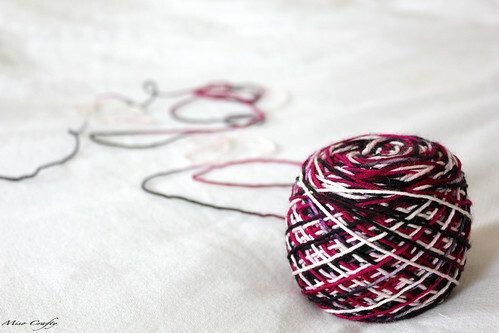 Miso Crafty Knits: Ready, Set, Knit!! Today is the official start day of the Westknits Mystery Shawl KAL!! Yippeeee!!! The first clue arrived in my inbox last night, which I promptly read and printed out. I just need to wind my yarn and cast on...that is, if I can make a final decision on which colour combo to use!! Eeek! Talk about last minute! And let's not even discuss the pressure I'm putting on myself to be on top of this KAL. I seriously don't want to lag behind and would love to finish this shawl by the middle of September. What's up with the pressure? Well, not only do I already have a fair bit on the needles already, but I also have a lot of other projects that I want to do. The pressure is merely to remember to get some knitting done per day. Not that I don't find the time to knit (cause I'm seriously the person who's knitting in the line up at the post office/supermarket), but lately my exhaustion levels are definitely making me zone out more which can sometimes cut down on my knitting time. Is everyone else ready to go? Ok...enough blogging. I got some serious decision making to do, yarn to wind, and a mystery shawl to cast on! 'Til next time, happy knitting!! I've already done the first clue - twice! Once with my first choice of colours, then I ripped it out and changed one of the colours (too green). Now done clue 1 for the week - it's quick and pretty easy.